Mmmmmmmmm Spices 🙂 The beauty of making your own tea is that you can easily tweak the spices to exactly your liking. The list of ingredients is open to interpretation – it really doesn’t matter if you’re missing a few things, or add some extras. The point is to make a giant pot of soothing tea that will help make getting up in the mornings a little easier, or your Christmas holidays a little fancier! Add tea of your choice (bags or loose leaf) and steep for 5 minutes, then strain. Add some form of sweetener too. Again, to suit your taste buds, no exact measurements required for a recipe like this! Pour chai into a container of some sort, and store in the fridge. Heat chai with some milk or cream and froth it together. You could also do this very easily in the microwave, but mine happens to be broken at the moment…. 1. Put water in big pot, add all the spices and bring to a boil. Reduce to simmer and cover for 30 minutes. 2. Remove from heat and add 2 or 3 teabags, or equivalent loose leaf tea. Steep, covered for 5 minutes. 3. Strain mixture into a glass jar or carafe, and sweeten to taste. 4. Mix equal parts chai and milk (or half and half or creamed rum if you’re feeling decadent). 5. Store in the fridge for a week. Put a whole bunch of seasonal fresh fruit into a punch bowl, or pitcher. Don’t forget to add the booze! Just a few bottles of wine. And some tequilla too. After it sits for a few hours (to ensure maximum fruit booziness), serve yourself up a big glass and enjoy! The drink that keeps on giving! 1. Cut up fresh fruit and put into pitcher or punch bowl. 2. Add remainder of ingredients and refrigerater for 2 + hours before serving. Serve over ice. Confession: I don’t like coffee. I’ve just never liked the taste of it. One exception: ground espresso beans in some sort of smore dessert from Murray Street restaurant. That dessert gave me a glimpse into the world of coffee addiction….so good. But it just doesn’t translate to liquid form for me, so I mostly ignore the stuff. But Chris does not! Within the past few years he has developed a full-blown coffee addiction, which I think is great because in an inexplicable turn of events, I LOVE the smell of coffee. 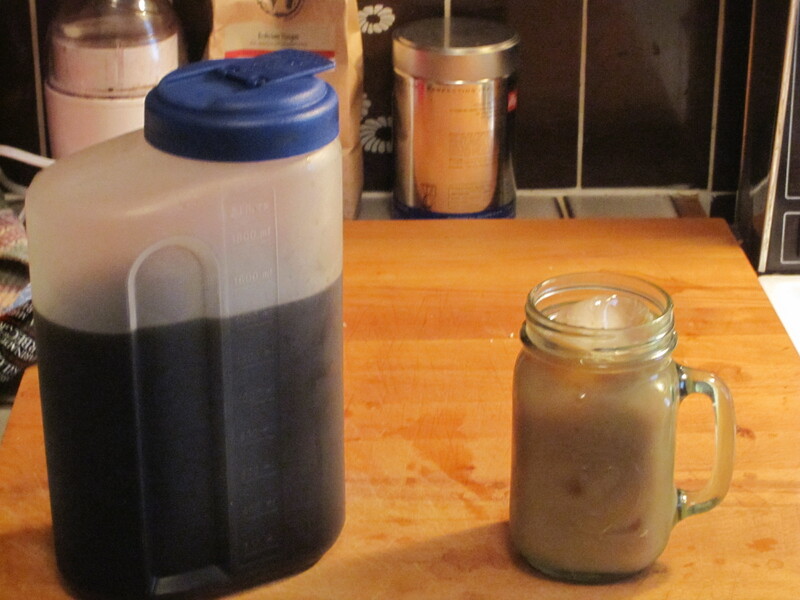 So I’m more than happy to share his adventures in home made iced coffee making; it looks and smells delightful. 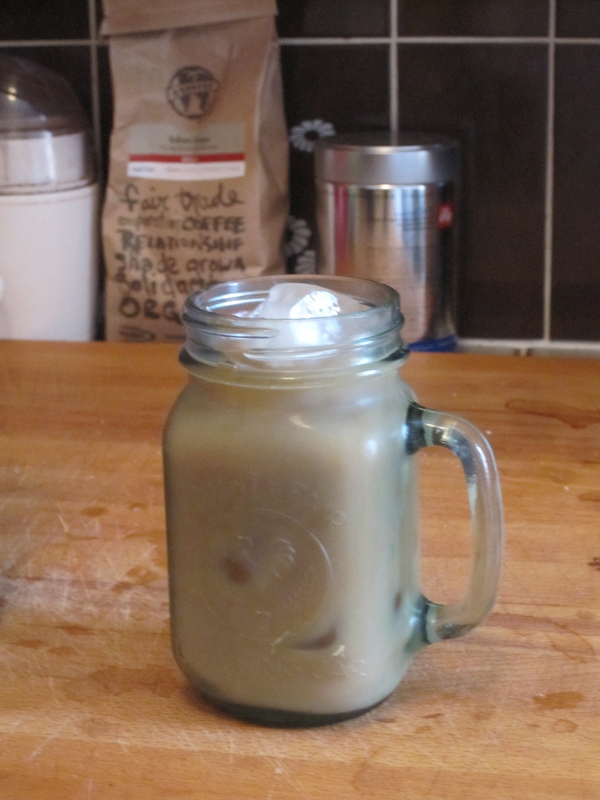 Apparently, making good iced coffee is more than just making a regular pot of coffee and putting it in the fridge. For some reason it just doesn’t work. And pouring hot coffee over a bunch of ice just makes it watery. 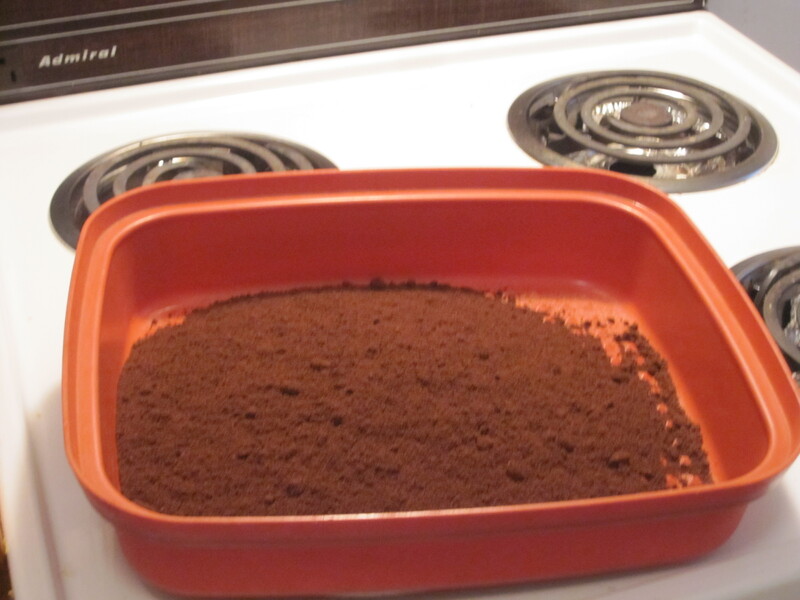 So to start, get a big tupperware container and pour in a bunch of coffee grounds. Next, add some water and put it in the fridge to steep for 6- 8 hours, or longer if you want it to be really strong. But not toooo long, or else it will get bitter. 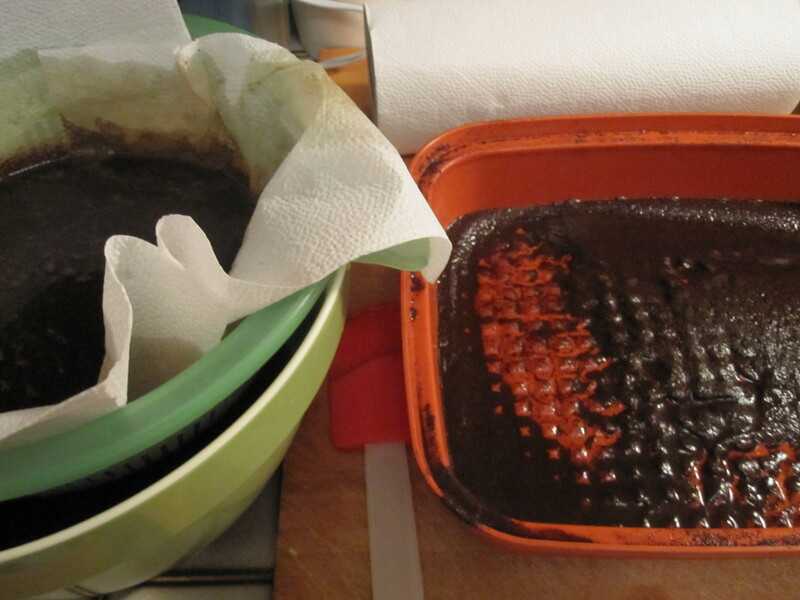 Then scoop (or slowly dump) the mixture through a cheesecloth or paper towel lined fine mesh strainer. Sit back and watch the delicious coffee mixture emerge. What’s left in the tupperware is kind of a coffee sludge – so to avoid having this in your coffee mixture, use a few layers of paper towels, and the finest strainer you can find. It might take a while to pass through, but it’ll be worth it! Transfer the coffee liquid to some sort of pitcher, and put it back in the fridge until you are ready to use, or it is adequately chilled. To prepare, pour about half a cup of coffee over ice, and add milk, half and half or condensed milk, depending on how rich you want it. Go sit on your deck/patio/balcony and enjoy! *Or if you aren’t in the mood for the decadence provided by the above two ingredients, just a splash of whatever milk you have in the fridge, no harm done. 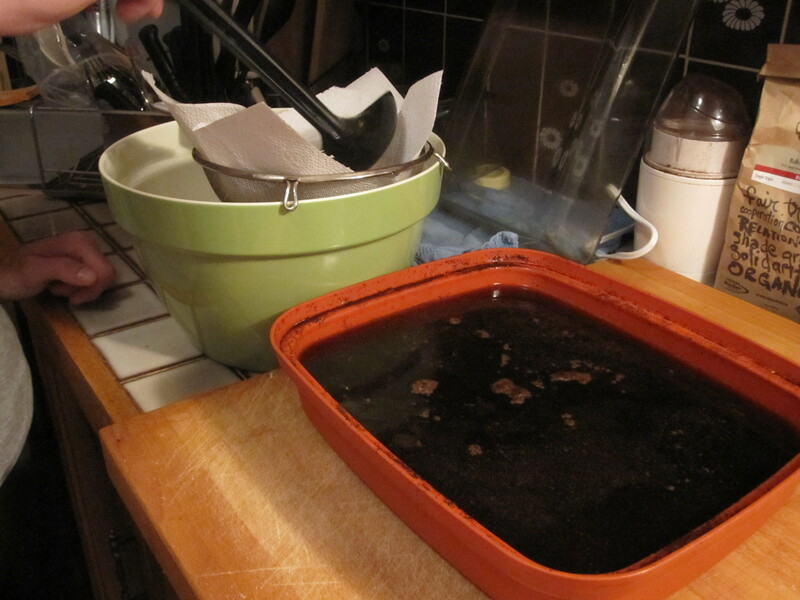 *Sugar, Artificial Sweeteners, Syrups…all would be good choices for mixing into coffee mixture. 1. In a large container, mix ground coffee with water. Cover and allow to sit at room temperature eight hours or overnight. 2. Line a fine mesh strainer with cheesecloth/paper and set over a pitcher or other container. 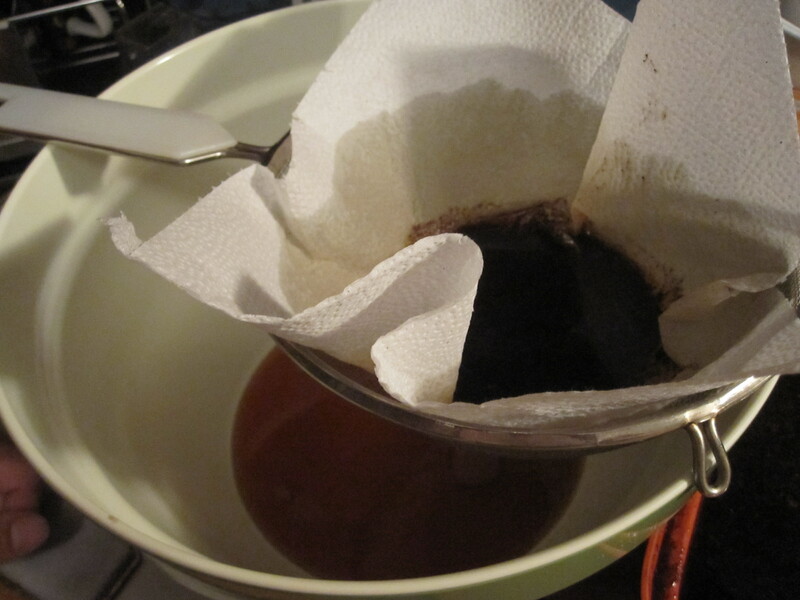 Pour coffee/water mixture through the strainer, allowing all liquid to run through. Discard grounds. 3. Place coffee liquid in the fridge and allow to cool. Use as needed. 4. To make iced coffee, pack a glass full of ice cubes. Fill glass 2/3 full with coffee liquid. Add healthy splash of half-and-half. Add 2-3 tablespoons sweetened condensed milk (can use plain sugar instead) and stir to combine. Taste and adjust half-and-half and/or sweetened condensed milk as needed.